Uh oh. I think I may have waited a bit too long to share the recipe for this tart with you. Feel that? Smell that? September in Seattle actually means the end of summer produce-wise. Those things that many of you get in July (squashes, tomatoes, corn, etc) we don’t really get until September. I’ve said this before but as amazing as our markets are in the peak of summer – tables filled to every square inch with berries, peaches, peas, green beans – fall is the produce season that makes me swoon. Heirloom tomatoes, corn, and summer squash sit right next to booths with winter squash, carrots, eggplants, and all manner of peppers. For the next six weeks or so, I will be a very happy shopper. This lovely tart was inspired by three things. One, my new rectangular tart pan. Two, a similar tart that Ashley made last summer in a class I attended. Three, a crust from this book I keep yammering on about. Ok, four – those gorgeous tomatoes that keep calling my name. This is actually quite simple. 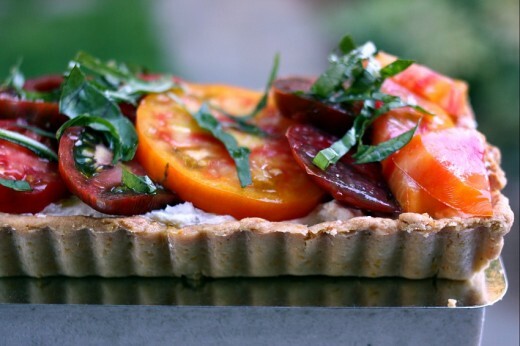 A cornmeal studded crust, soft goat cheese mixed with fresh basil, perfect tomatoes, salt. Oh all right, I did use a secret weapon. Rather than just drizzle the top with olive oil, I took a cue from Purple Citrus & Sweet Perfume and mixed together some pomegranate molasses, lemon juice, and olive oil. I drizzled that simple but intoxicating mixture sparingly over the top and gave it a healthy sprinkle of sea salt. You know how once in a while you take a perfect bite? What is in your mouth is an ideal mix of texture and flavor? This tart is full of those bites. The cornmeal in the tart dough gives it a delightful crunch and a bit of sweetness – also, the crust has more heft which is a nice contrast for the creaminess of the goat cheese. The tomatoes, of course, are the star but they are certainly helped along by the sour punch of the lemon and pomegranate molasses. I hope you don’t have to wait until next year to give this a try. One funny note. I balanced the tart on the railing of our deck for these photos. I am a bit vertically challenged and was having trouble getting enough distance from it to get a good photo. I didn’t want to put it on the ground. Randy, who is 9 inches taller than I am, offered to take a shot. So here is the view from 6 feet. One last piece of news! My friend Jen and I are doing another yoga retreat together on October 1st. These dates always sell out which is why I’ve never mentioned them beforehand. This time, with the busy fall that we are all diving into head-first, there are a few spots. Come join us on Bainbridge Island for the most amazing yoga day complete with lunch made by me. Details are here. If you don’t have a 14 x 4-inch rectangular pan, this can also be made in a 9-inch round tart pan. 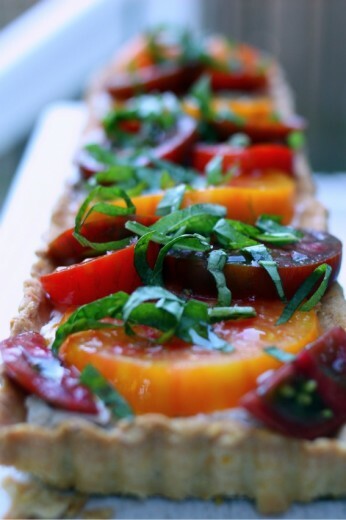 I also made mini tarts for a party and used colorful cherry tomatoes as the topping. You will have left over pomegranate molasses mixture but it’s pretty great on just about any vegetable. Place the flour, cornmeal, and salt in the bowl of a food processor fitted with the metal blade. Process until well combined. Add the butter and pulse until the mixture resembles bread crumbs. Add the egg and process until the mixture comes together. Dump the dough out onto a lightly floured board and knead to bring it together into a cohesive mass. Flatten into a rough rectangle, wrap in plastic wrap, and refrigerate for 2 hours. Preheat the oven to 400ºF. Roll the pastry out into rectangle about 1/8th of an inch thick. Carefully transfer the dough to the pan. This dough is very stiff and can be difficult to roll out without tearing and cracking. You can also just press it into the pan with your fingers rather than rolling. Trim any edges. Prick all over the bottom with a fork and place the pan in the freezer for 10 minutes. Remove from the freezer, line with parchment paper or foil, and pour in pie weights or dried beans. Bake for 15 minutes. Carefully remove the pie weights, return to the oven for 8-10 minutes, until the crust is a nice golden brown. Cool completely. Place the goat cheese in a large bowl and mash roughly with a fork. Add the cream and mix well to combine. (The cream will make it, um, creamier, and will also help with the chalkiness that goat cheese tends to have.) Gently mix in the basil. Season with salt and pepper. Scoop the goat cheese into the cooled crust and smooth it with a spatula. Slice the tomatoes and layer them in decoratively. Mix together the pomegranate molasses, lemon juice, and olive oil. Drizzle the mixture over the top of the tart. Sprinkle with a healthy pinch of your best sea salt and a few more ribbons of basil. The pomegranate molasses in the drizzle sounds lovely. Can’t wait to try that! Love the rectangular tart shape too. That is so perfect I just let coffee dribble out of my mouth and onto my chin and clothing. I must get my hands on the pomegranate molasses! I can imagine the flavors here– delicious! And I will have to try that nutella pound cake. I have been on a nutella binge lately! A perfect bite? Sure sounds like it. Looks gorgeous for that last bite of summer. I was wondering how much pomegranate is in the molasses? I have had a transplant and cannot eat pomegranate’s per se. 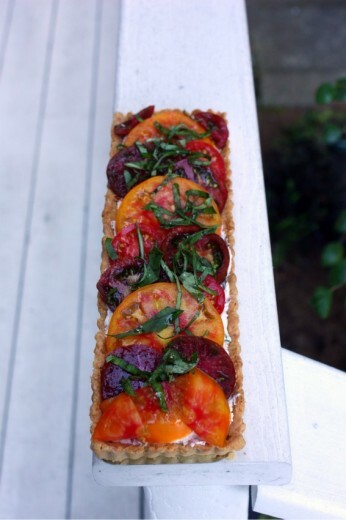 This is a tart after my own heart Dana with the goat cheese and the intense tomato flavour of the heirlooms and pomegranate syrup. This looks sooo perfect. I did not find ONE heirloom tomato in my stores here in Tampa this year. Grrrrrr. Such pretty colors in those tomatoes. Loving this gorgeous tart. This looks A-MAY-ZING. And thanks for another opportunity to use up a bit more of the jar of pomegranate molasses in my pantry. It just sits there most of the time. Can’t wait to make this later this week. This is gorgeous! Wish I lived closer to join your yoga retreat! Gorgeous. Now I need to find me some heirloom tomatoes as mine are still green on the vine. Omg… I am totally making this next weekend for a dinner party that I am having! Thank you!!!! Question – where does one find pomegranate molasses?? Two questions about the molasses I thought I would answer here. Sharon, I am not sure about the actual content of pomegranate in the molasses – maybe just the juice? That is something I would try and seek out online – I hate to give you the wrong info. And Angie, I have found the stuff in a well-stocked grocery store. Usually it is found in the “ethnic” aisle near the chutneys and things but occasionally they have it near the syrups and things. It is very sour and totally delicious and will last near forever in your pantry. I’m thinking back to that post where you wrote about the quality of your photographs, and thinking you couldn’t be more wrong because these are absolutely gorgeous! You’re not too late in my neck of the woods! I just bought some green zebra tomatoes yesterday and now I know how I’ll be using them! Just need to obtain a tart pan first. I’m seriously obsessed with tarts lately. this looks so lovely! i love the pretty tart pan. thank you for sharing this. The tart is gorgeous. 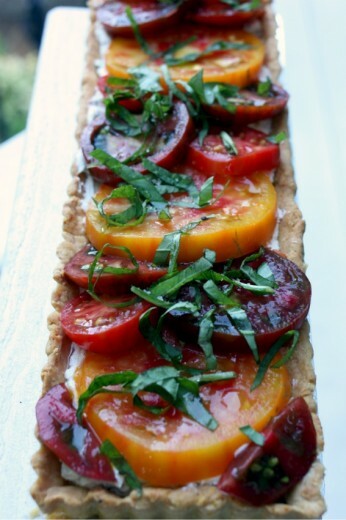 You can’t beat heirloom tomatoes. I am going to miss them! you know how to get me, don’t you? I want to make them both! This tart is gorgeous enough to hang in your livingroom! This tart has my name all over it! I made 5 of them with ricotta, chevre and mozzarella, with the end of my Jersey heirloom tomatoes, but thought if I post one more recipe with tomatoes, or one more tart, I may be kicked off my blog. What a beautiful tart Dana! Definitely worth sharing even though it’s not quite summer anymore.